Publication History: This article is based on "Crain's Analyzing Fractured Reservoirs" by E. R. Crain, P.Eng., 2004. This webpage version is the copyrighted intellectual property of the author. A fracture is sometimes called a joint and, at the surface, are expressed as cracks or fissures in the rocks. The orientation of the fracture can be anywhere from horizontal to vertical. The rough surface separates the two faces, giving rise to fracture porosity. The surfaces touch at points called asperities. Altered rock surrounds each surface and may contain solution porosity. Infilling minerals may cover part or all of each surface . Minerals may fill the entire fracture, converting an open fracture to a healed or sealed fracture. Fracture porosity is usually very small. Values between 0.0001 and 0.001 of rock volume are typical (0.01% to 0.1%). Fracture-related porosity, such as solution porosity in granite or carbonate reservoirs, may attain much larger values, but the porosity in the actual fracture is still very small. Fracture porosity is found accurately only by processing the formation micro-scanner curves for fracture aperture and fracture frequency (fracture intensity). Reservoir matrix porosity and permeability, including that attributed to fracture related (solution) porosity, can be found by normal porosity calculation methods. Reservoir simulation software that accounts for the fracture system is often termed a “dual porosity” model. While this is strictly true, it would be better to think of them as “dual permeability” models, since the fracture permeability fed by the matrix or reservoir permeability is far more important than the relative storage capacity of the fractures and matrix porosity. A reservoir with only fracture porosity is quickly depleted; a decent reservoir in the matrix rock feeding into fractures will last much longer. Fractures are caused by stress in the formation, which in turn usually derives from tectonic forces such as folds and faults. These are termed natural fractures, as opposed to induced fractures. Induced fractures are created by drilling stress or by purposely fracturing a reservoir by hydraulic pressure from surface equipment. Both kinds of fractures are economically important. 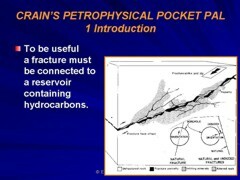 Induced fractures may connect the wellbore to natural fractures that would otherwise not contribute to flow capacity. Quantitative prediction of porosity and permeability of fractures relies on the fracture aperture, measured in millimeters, from resistivity micro-scanner or observation of cores or core images. Note: Equations 2, 3, and 4 give identical results. These examples represent well fractured reservoirs. You can see that the volume of hydrocarbon is very small but the permeability is very high.